Whilst it's considered bad English to use double negatives, in French double negatives are the correct form in some combinations. Je n'ai jamais rien dit! I never said anything! / I didn't say anything, ever! On ne va jamais nulle part! Note that you can mix jamais, rien, personne and nulle part (never, nothing, no one, nowhere) with each other. Note: jamais always comes before rien, personne or nulle part. Je ne ferai plus jamais ça! Je ne ferai jamais plus ça! I will never do that again! Je ne reconnais plus personne. I don't recognise anyone any more. Ils ne mangent plus rien. They don't eat anything anymore. Vous n'allez plus nulle part. You don't go anywhere anymore. You CANNOT mix ne... pas/guère/point (not, hardly, at all) with rien, jamais, personne or nulle part. Hi Ron - yes, I see it needs a little tidy up - we'll do that, but in fact the note has examples underneath which show each case so that should help. Je ne dirai plus jamais rien à personne. -- I will never again say something to anybody. Je ne dirai rien à personne. -- I won't say anything to anybody. Je ne le dirai jamais à personne. -- I wont ever say it to anybody. Is this correct: "Je ne veux plus jamais y aller"? Or is it: Je ne veux jamais y aller plus"
Hi Helen, the first is correct but not the second. You could also say, "Je ne veux jamais plus y aller" (i.e. you can put jamais before plus, unlike most other negatives which must go after it). Thanks a ton! I was asking an 8th grade French teacher this and we couldn't figure it out! You are most helpful. Il ne me restera plus qu’à prendre mon sac. Could you help with this sentence please? I'm genuinely confused as to whether this sentence is another example of a double negative (no longer, only) or is just a conjunctional phrase: All (that) I'll have left to do will be to grab my bag. Or is even a conjunctional phrase using double negatives!!?? Help greatly appreciated. Thanks. For me this sentence seems awkward. Il ne me restera qu'à prendre mon sac, should translate: all I will have left to do is take my bag. 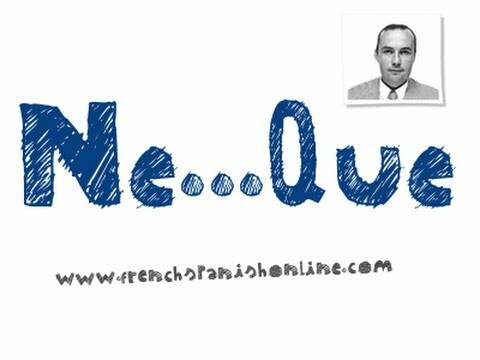 ne. . . . .que = only which is a fairly common phrase in French. From the lesson: You can also use any of those with ne ... plus (not anymore): plus jamais OR jamais plus, but ONLY plus rien, plus personne, plus nulle part. Yes I must say that I agree the sentence would be a lot more straight forward if 'plus' were omitted. However in the writing test in which I first saw this sentence (Week 21 - B1 I believe) it was present, which is exactly what prompted my question. I'm aware of the double negative combinations presented in the associated lesson, but unfortunately that lesson didn't offer any guideline at all on the use of ne...que with a second negative, or even if such a construction were possible. Had that information been provided I sure I wouldn't have need of further clarification. Forgive me but this question had remained unanswered for almost two months so I'd mostly given up on a response. Thank you. Pas de problème ! Je ne me joins qu'il y a 4 jours et je ne fais pas partie de l’équipe du site. J'ai vu que ce qu'il y a eu un peu de questions sans une réponse. Alors. . . Bonne chance. In the examples, 'dire' goes after the two negations while 'faire' and 'aller' goes before them. What's the rule here? Bonjour Joakim ! Here it's not about the verbs, but about the tenses they're conjugated at. Indeed, "dire" is in Le Passé Composé, so the second part of the negation is between the auxiliary and the past participle, whereas with simple tenses, it's just after the conjugated verb. You can have a look at these related lessons: Using 'ne ... pas' with compound tenses (negation) Using ne ... pas with simple tenses (negation) I hope that's helpful! À bientôt ! How many negatives can you fit (grammaticaly) into a French sentence? Interesting question. I'm going to say four: Je n'y ai jamais plus rencontré personne avec aucun accent. I've never again met anyone there with no accent.